For the 10th consecutive year, Webster University was recognized by the American Volleyball Coaches Association with a Team Academic Award. The award recognizes teams who have matched their dedication to the sport of volleyball with excellence in the classroom. 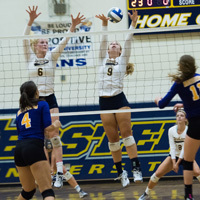 During the 2017-18 school year, Webster's volleyball team compiled a 3.62 team grade point average that placed the Gorloks in the Top 25 of all NCAA Division III programs nominated for the award. 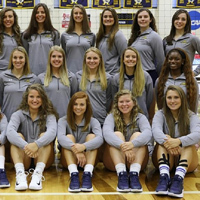 For the ninth consecutive year, the Webster University women’s volleyball team has been recognized by the American Volleyball Coaches Association (AVCA) with a Team Academic Award. The 2016 Gorloks also raised their team grade point average (GPA) for a third straight year, maintaining a lofty 3.64 for 2016-17. Two Webster University alumni, Crystal Spinner and Katy Meyer, have been inducted into the St. Louis Intercollegiate Athletic Conference (SLIAC) Hall of Fame. They will be inducted during the SLIAC Awards Banquet on May 16. The Webster University volleyball and men's and women's basketball programs will once again be offering camps this summer. Both sports will be offering a variety of camps. All camps will be held in Grant Gymnasium and registration is now open.